As a foreigner with no previous experience at an Indian wedding, the #StruggleIsReal to find dresses you’ll feel comfortable and beautiful in. (And yes, that’s dresses, not dress. You’ll need more than one!) You wouldn’t think a wedding guest would need such an involved dress-finding process, but it’s necessary. 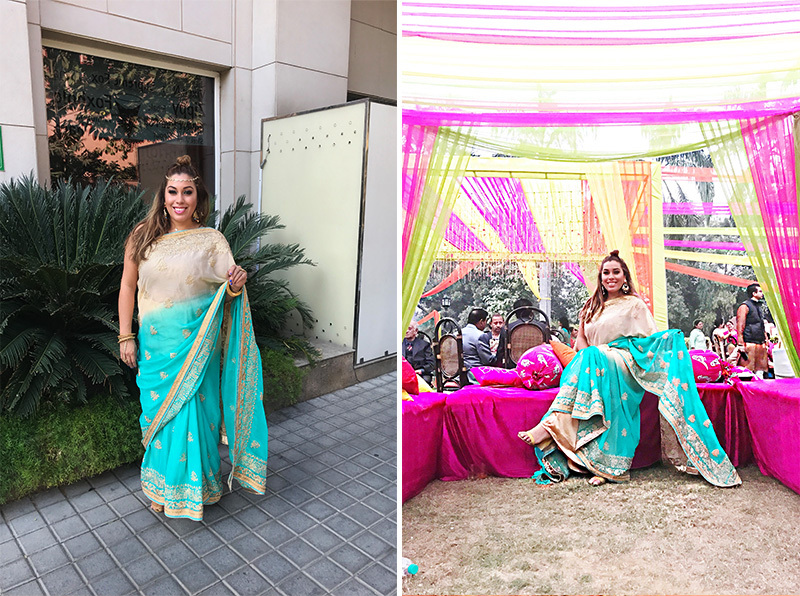 So let me share my experience on how to dress as a guest at an Indian Wedding! The shopping style of these clothing markets is like nothing I’ve seen in America, and it takes some adjustment for the native people to know how to tailor to your body type. If you’re on the healthier side (#More2love #Curvacious) I suggest you get to India a few days ahead of time to have plenty of time to get your outfits fitted and custom made to your size. And I will say, it isn’t easy. After being surrounded by men showing me dress after dress, yelling that I was “Too big!! Too big!”, and showing me unflattering clothing, I was frustrated to the point of tears. Here’s how to have a better shopping experience than I did. Dedicate a full day to dress shopping, this shouldn’t be rushed. Dresses run from $100-$900 and custom made can cost around $400-500 dollars. It’s worth the investment, and after seeing my friends’ looks, I had wished I arrived sooner to have more time dedicated to finding the perfect dress. Bring your girls.. You will need the support, and trust they know what looks good. Bring your spanx, don’t leave those behind. Don’t stress. You’ll find something perfect just for you, as there are endless styles. Vivid Color is the way to go, and the brighter the better! No dress is to much or over the top, it’s all about looking like a princess. After seeing a woman head to toe in Swarovski crystals, my way of seeing bling was changed forever. Never wear black or white. It’s the color of mourning and death. Steer clear of red, too – that color is for the bride ONLY. So how many dresses do you really need? For the reception-like Sangeet ceremony: This takes place the day before the wedding, and the brighter the the dress, the better. I wore a saree and felt beautiful. For the Wedding Ceremony: Bring out the glam, and go all in. You can never be too over the top! Wear your fancier dress on this night. I wore a saree both nights because my fancier dress wasn’t fitted correctly to my body. I now regret not getting it custom fit, because everyone else was so bedazzled! The lengha has a similar appearance to a saree, but instead of wrapping/draping loose fabric, it easily put on and just needs the dupatta to be pinned. Wearing the lehenga covers more of the midriff than a saree would. Also known as ghagra choli or chaniya choli, a lengha has a long umbrella-cut flared skirt that is eye-catching and stunning. It comes with a small matching top called a choli but people mix and match. There is a tightly fitted piece of clothing around the waist but it could be short, or long, or extended below the waist in a loose blouse trend. It also comes with a a beautiful dupatta, or chunni, to cover he head and body as a sign of humble shyness for the wearer. What is a Indian saree? A “sari” (sometimes spelled saree) is a 6 meter long fabric wrapped and draped on the body. It comes in all colors with intricate designs and jewels. 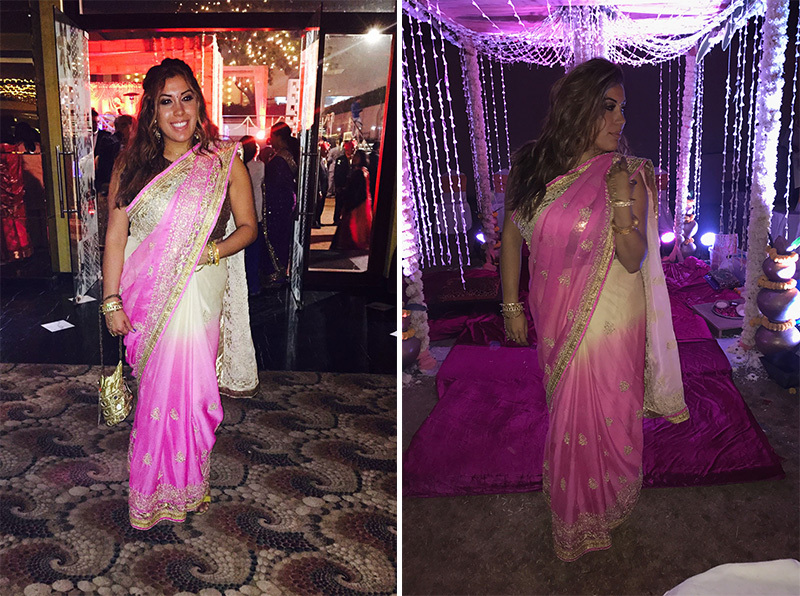 A saree is an expression of one’s unique and ancient culture, and truly one of my favorite things to wear because it works with all body types. You just need a top (gold preferred) that you can wear underneath, or you can have a custom top made from the extra fabric of the sari to match. Three things to remember about wearing a sari. Sari draping is considered as an art and requires a lot of practice. Women from different regions all have their own style. You’ll look at a sari and know where someone is from depending on the draping. It looks gorgeous on women of all ages and builds. Sarees are worn on a daily basis in India. However, just like we have Sunday clothes, there are Sunday sarees, party sarees, wedding sarees, funeral sarees, etc. Girls typically start wearing a sari when they are at least 16 years or older. You can wear a regular dress as long as it is conservative, vibrant, and it fits in with the other traditional clothing, but when in doubt, wear a sari. You can’t go wrong with a sari. Lets just say that a Sari is a miracle worker. It hides everything in place while letting the vibrant colors take front stage to make you look simply incredible. In India, women are fully aware that a smaller heals means more dancing and less pain over the three day celebration. It is not in the Indian culture to wear heels anyway, and people prefer flats. But if you just love heels, get a pair of Indian heels. They are about 2 inch high, and come fully bedazzled. You can find them in all colors in markets, and in any styles. As a foreigner it’s important to know that you can wear whatever you feel comfortable with and whatever is within your budget. All married women wear all their real jewelry and take out their most expensive and best jewelry they have, you won’t see anything fake on them. In the indian culture gold is something that women obtain over time, and bring them out for the special occasions like weddings. This is simply to show their marital status, it is not a competition of who has the finest jewelry. But if you’re not Indian, you don’t have to keep these things to mind. Just find Indian jewelry that adds to your look and makes you feel beautiful. But if you’re not used to sparkling so much, step out of your comfort zone and get ready to bling. Bracelets are a favorite and an Indian wedding must. You have hand bracelets, ankle bracelets, crown pieces, and even ear cuffs. No look is complete without the charm of jewelry galore. Eye-catching jewelry is the way to go. All you need to find the perfect dresses is some time, some help, and some bling. Don’t worry about standing out, because everyone will be bedazzled more than you. The only comment our expert said was “It should be Indian” -Vasundhara Saxena, so people will appreciate you respect for their customs and traditions, and they understand that you are trying your best. 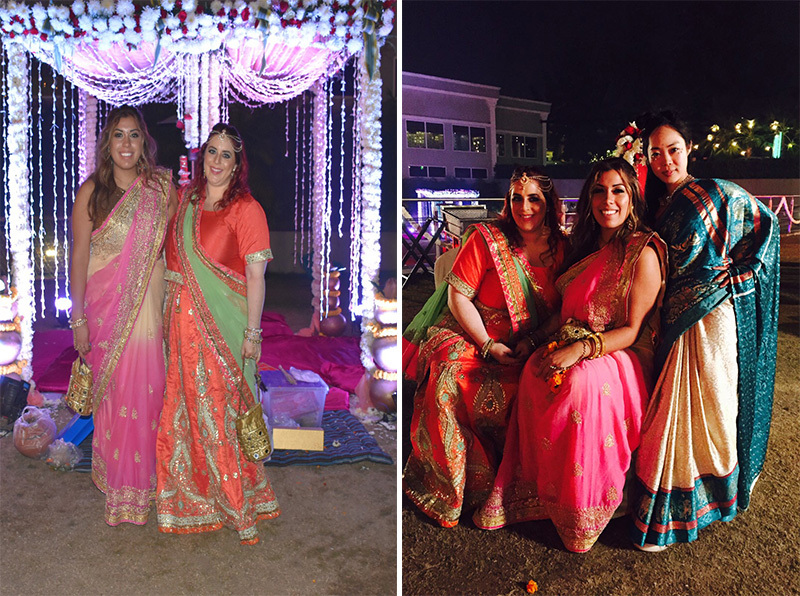 A special thank you to Rena Unger for taking us shopping throughout India in search of the perfect wedding attire to know how to dress as a guest at an Indian wedding, and made us feel like princesses during our friends wedding. Another thanks to our special guest expert Vasundhara Saxena for inspiring us to look deeper with beauty. Absolutely obsessed with this article. 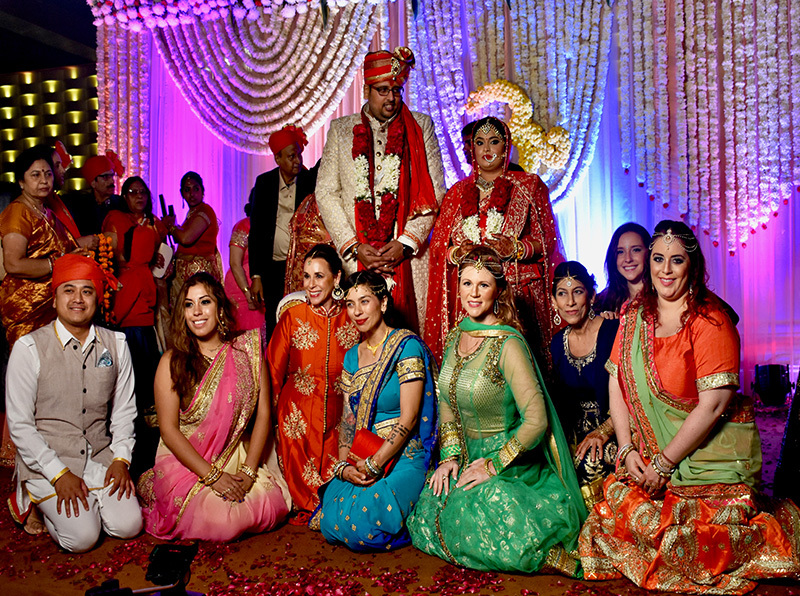 I want to go to an Indian wedding so bad now! beautiful pictures, can’t wait to go to an Indian wedding so I can put these to use!!! I’m reading and I feel I’m reading a beautiful and enchanting story.